End of November, 18 students of the University of Soest accompanied by Prof. Dr. ing. André Goeke were our guests. 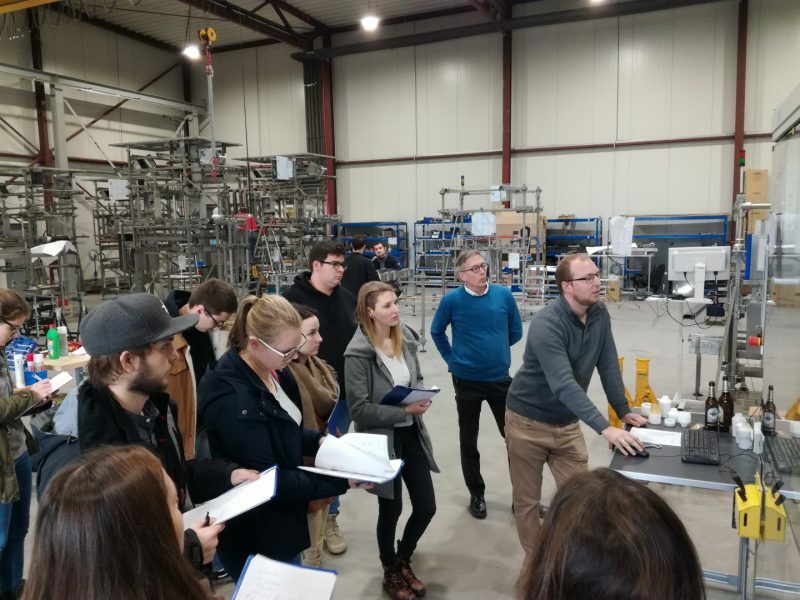 The participants of the study module ‘Project work’, which is taught by our colleague Kornelius Böcher (responsible for the technical documentation at vision-tec) are students from the 3rd semester. The excursion was intended to deepen the information of a sorting plant mediated in the theoretical lessons and via video through practical demonstration and presentation. After a presentation of the company by our Managing Director Claudia Wilke and speeches by Uwe Schneider (construction), Benjamin Otte (software development) and Torsten Thiel (service), the goup went into the production, where the machine could be watched in function. The questions of the guests were answered by Christoph Michels (sorting robot) and Benjamin Otte (empties inspection). At the same time the students could go on with one of their practical tasks: create high-quality photos of machine components. Afterwards, the participants were divided into small groups to research discussions in the various departments. Here they could gain a practical insight into the interfaces between the various departments – with a focus on the key processes of the technical editorial – and meet the next practical task: the exercise of information discovery (research), which represents a further focus of the wide-ranging curriculum. We like to thank again for the visit and the constructive discussions and wish success for their further studies to the guests!